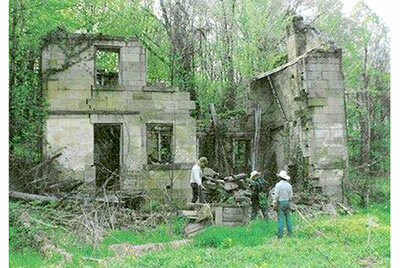 In the 1700s the Giffin Stone House was carefully build of hand chiseled sand stone in western Belmont County, Ohio. During the 1800s it was used as a stage coach stop and inn half way between Pittsburgh and Columbus. A pike stone road provided an all weather entry to and from the Giffin. In the mid 1900s this whole area was strip mined. Although the dwellers of Giffin had gone on years in advance, as a result of the mining, a federal reclaim drainage control dam was constructed below the Giffin. Over years sediment built up and caused the foundation to slip and fall over in the swampy area near the constructed lake. As the ground softened, little by little the walls moved and fell over. This photo was taken in 1994 when Dickinson Cattle Co, LLC first acquired the joining land. During the last 20 years most of the walls have continued to lean and fall. These are some of the standing walls. It was double stone with hand chiseled inside and out. This was a mansion during the 1700s. Probably designed with the idea of a fort for protection in the unsettled land. This is Trent and Roger, two of the hard working stone movers. These guys have moved more tons of stone than some lifers have busted in prison. Call DCCI, 740 758 5050 if you need beautiful historical stone.